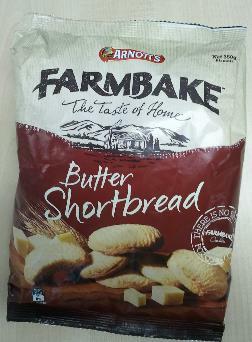 There’s something quite appealing to me about biscuits that come in bags. They are associated in my mind with a sort of devil-may-care eat-as-many-as-you-like attitude, possibly because when I was small my parent used to sometimes buy large bags of broken biscuits from the market, and you had to eat them quickly as they were usually on the verge of going stale. You don’t see broken biscuits at the market any more for some reason; markets nowadays seem to be more about hideous china cups and retro (meaning ‘broken’) electrical goods. 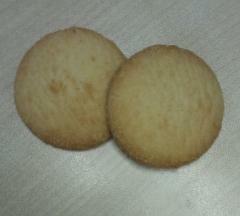 These butter shortbread are made with 14% butter, and are the same size as the Choc Chip Cookies, at 45mm across. 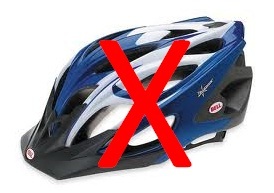 They are thicker though, especially in the centre as they are quite domed. You get a generous 28 biscuits in a packet, so can make yourself feel quite ill if you choose to eat a lot of them in one go. I can attest to this from experience. Leaving aside the fact that when you hit biscuit number twenty all that butter sitting in your stomach makes you rather queasy these are really quite pleasant. Nice and crunchy with quite a rich flavour; although if I was to be picky I’d say the vegetable oil comes through just a bit too strongly – perhaps they could have done with slightly more butter? I’m going to give these a solid seven out of ten. I am very excited to announce that Baby Chillikebab has graduated. She took her first steps a few weeks ago, and has been gradually gaining confidence walking upright since. As such, she will henceforth be known as ‘Toddler Chillikebab’. Going along with this new found locomotion is a high degree of curiosity about everything – especially the heaters, which we have had on from time to time given the chilly weather. Mrs Chillikebab therefore told me to do something to prevent little fingers getting burned, so I took it upon myself to build a kind of gate / enclosure thing that would block access to the gas fire. After designing a very swish wooden affair with upright bars I set off to the hardware store to get the bits. The timber I wanted came in five metre lengths – and even for the Radish this seemed too much. The man helpfully cut them down to three metres for me to load onto the bike. The staff in the store seemed most amused as I loaded up and rode off, and offered to put some hazard tape on the protruding planks. 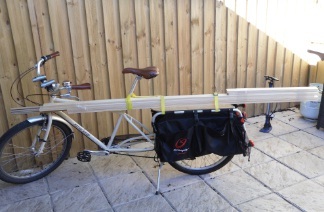 Riding home was very easy, even though I was reaching the pedals over the top of the bundle of wood. Chewy. Ahh, chewy. I do enjoy a good chew; a good hunk of golden toffee, some hard jubes, even some Redskins now and again. So as you can imagine, I was pretty excited to get my hands on the Chewy Caramel version of the Tim Tam. I rushed them home, but rather than tearing into them, I carefully put them in the fridge. I wanted to get the optimal chewy experience, so painfully watched the minutes tick by as they cooled down. Oh yes. By now my gums where aching in anticipation of needing to chew ‘hard or for some time’. Nom nom nom. Finally, I judged they were ready. I took them from the fridge, and took one out. They look just like regular Tim Tams, but I knew better. 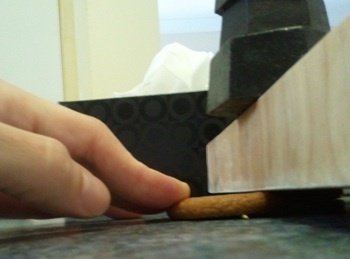 Nestled between those two biscuits was a layer of chewy caramel capable of delivering ecstasy. I took a bite, wondering if the caramel would crack and then need softening in the mouth, or would extend into a long string as I pulled the biscuit apart. It did neither. It just sort of collapsed in a soft, unstructured way. What was wrong? Was there some mistake? I took another bite, but the realisation was dawning. These were not chewy at all. They were insipid and flabby; filled with run of the mill soft caramel that my one-year-old’s toothless gums would make light work of in a matter of moments. What a disappointment. I was crushed; a broken man. There would be no chewing for me that day. Disconsolately I finished the packet, numbly noting the runny caramel depicted on the pack that I had previously missed, teasing me about my chewing fantasies. These deserve a one out of ten. Not because they are that bad; indeed if they were simply called the ‘Caramel Tim Tam’ I’d probably give them a creditable six or seven. But to play so fast and loose with my emotions, to inflict such cruelty – well, for that they get a one. What happens when you take a regular Tim Tam and give it an extra thick chocolate coating? Well, if that thought has been keeping you up an night, never fear as you can find out simply by visiting the biscuit aisle of your local supermarket. Well, if you live in Australia at least. I have to say, I am somewhat suspicious of the ‘double coat’ moniker. This implies to me that regular Tim Tams have been taken of the production line, and then passed through the chocolate enrobing machine for a second time. However, I looked very hard at the coating on these biscuits, including examining the cross section with a magnifying glass and experimentally etching the top surface with a sharp knife, and it seems to me that this is just a singe thick coating. I suppose it’s possible that the heat in the machine might be enough to fuse the two coats together making the layers imperceptible, but I have my doubts. 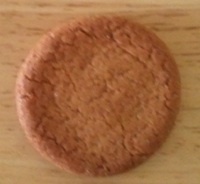 The biscuits look different to regular Tim Tams as the slightly dimpled appearance of the normal chocolate coating is replaced with a smooth, glossy look. It’s actually quite classy. They taste good too; it sounds a bit boring to say they taste like a kind of extra chocolatey Tim Tam, but, well, that’s how they taste. Finally, apologies for the grainy pictures. I bought these to share at orchestra tea break, and it was rather dark at the rehearsal hall. However I had to grab one and photograph it quickly, as they were very popular – especially amongst the violinists. I practically got swept away by a stampede of second violinists when they realised what was on offer.